​​Just about any plant with the right lighting and in the right environment can be grown indoors, but it turns out that determining ideal conditions for growth is not a one-size-fits-all affair. Today, it is pretty well established that different plant species have different needs and requirements, and this happens to be especially true in the realm of lighting where different plant species react differently to different wavelengths of light. This is why it is important to understand the effect of different lighting conditions on a plant species-by-plant species basis. One recent study that emphasises this point looked at the growth of strawberry plants under different kinds of artificial light with some interesting conclusions that might be relevant to anybody thinking about growing their own strawberries indoors. ​​One of the problems with growing tomato plants in artificial environments especially under artificial lighting is a physiological disorder that negatively affects the​ir growth and ultimately also the tomato fruit yield. The disorder manifests itself through the appearance of callouses or bumps on the leaves and veins of the plants, and rarely occurs in tomato plants that have been grown in greenhouses. We at LED Grow Lights HQ, have personally experienced this issue when growing cherry tomato plants indoors under the TaoTronics LED grow light - no longer sold - (which emitted light in three light wavelengths, namely, red (630nm), orange (610nm) and blue (460nm)). Fortunately in our case the problem was not too serious, and we were able to get a decent enough yield of tomato fruit. However, the disorder is likely to be an important issue for any growers thinking of using artificial environments to grow tomatoes, and it would be nice to avoid this problem in any of our own future indoor tomato grows. Anyone debating whether to use fluorescent lighting or LED lighting for indoor gardening, or ​trying to decide on which ratio of red to blue light to use, may well be advised to pay attention to ​this recent South Korean study, especially when it comes to the ​lighting ​requirements of seedlings. In this 2018 study, the researchers briefly grew 2-week old cherry tomato seedlings under different combinations of red and blue light versus a fluorescent light control for 4 weeks before transfer to a regular greenhouse (i.e. natural sunlight) with some striking results. ​For all the tomato growers out there. A study done in 2012 highlights the value of supplemental inter-lighting (lighting that is right in amongst the leaves, providing light to the lower shaded areas of the plants) on tomato production. In this study, the researchers from Japan, grew tomatoes in a greenhouse setting (ie. with natural light) but supplemented with fluorescent inter-lighting. They found that the application of this intra-canopy lighting specifically during the tomato fruit development stage could significantly increase the weight and sugar content of the tomatoes produced. ​​IKEA is one of the latest mainstream retailers to jump onto the indoor gardening bandwagon with their own range of indoor gardening equipment allowing anyone to grow their own herbs at home. The IKEA indoor gardening system is not dissimilar to indoor herb gardens from other indoor gardening specialists, but with IKEA's focus on interior design, the indoor garden ​blends more harmoniously ​into the home. The IKEA indoor garden is simple but stylish in the typical IKEA way. The simplicity of the system makes the setup of ​the indoor garden a painless process that is ideal for the non-green fingered amongst us. Impressively, IKEA even provides ​us with everything ​we need to go from seed to harvestable herbs without the need to look anywhere else. ​Once you have got the indoor-growing bug, there is almost no limitation as to where you can actually set up your indoor garden, and if you do it in the right place, the endeavour can even be quite profitable too. Just ask the founders of Growing Underground, who have recently set up an indoor farm over 30m below the streets of London in a disused World War II air-raid shelter of all places. Crucial to its success is its proximity to lots of food markets and eateries allowing them to carve out a niche in London’s fresh produce market by producing ultra-fresh produce that tastes better and is more nutritious since only having been harvested just a few hours earlier. Growing Underground is the creation of Richard Ballard and Steven Dring, two entrepreneurs that spotted a gap in the London fresh produce market but they also have some pretty impressive directors on their board including Chris Nelson, a consultant well-known in the horticultural arena, and Michel Roux Jr., the chef patron of the Michelin-starred Mayfair restaurant, Le Gavroche. The growing tunnels themselves are located underneath London Underground’s Northern Line where the farm remains isolated from changes in seasonal variations in surface climate allowing produce to be grown year-round. In addition, the underground location is not accessible to typical farming pests and diseases so pesticides are unnecessary making the produce even more desirable. Unsurprisingly, the founders have opted for using hydroponics to make the system as efficient as possible and to dramatically reduce their water requirements, and LED lighting is used to optimise growing conditions while keeping energy costs down. So far, Growing Underground has been successful in marketing Watercress, Thai Basil, Red Vein Sorrel, Pea Shoots, Mustard, Red Amaranth, Garlic Chive, Coriander, Mizuna, Rocket, and Radish, and the company is doing so well that it just recently secured further funding to expand into yet more underground tunnels. ​Vertical gardening is slowly but surely becoming mainstream, even spreading to environments that one would not normally associate with much greenery like the work place. One such example are PodPlants which were developed specifically to cater to the office environment. PodPlants are 2.4m high sealed vertical garden modules that are designed to be free-standing and low maintenance. The units are made out of recycled ABS plastic but the walls of the unit are kept very thin making each PodPlants unit weigh in at only 20 kg which is unusually light given the overall size. They use a patented irrigation system developed by the creator where the exposed roots of the plants dangle within the device, and is based on the increasingly-prevalent aeroponics technology which feeds plants using an air-suspended mist of nutrient solution. One of the problems with many aeroponics setups is that they are also a breeding place for bacteria, but the inherent design of the patented PodPlants is designed to address this issue. 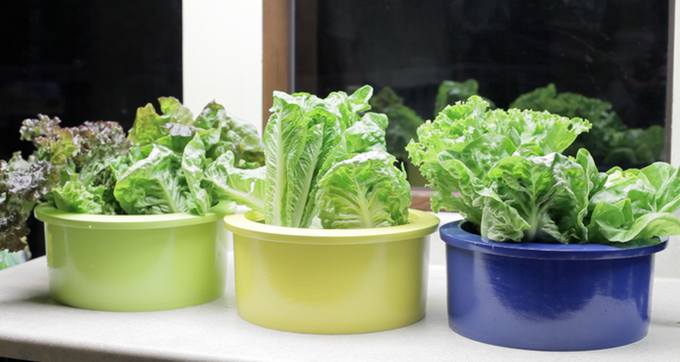 As a result, plants grown in PodPlants are healthier allowing them to grow more vigourously. The PodPlants are very easy to install, with the only requirement that they be located next to a power socket - no additional piping or drainage is required as with other vertical gardens. One reason for the increasing popularity of plants in the work place is the recognition that they not only increase the health and wellbeing of their workers but also increase worker productivity as much as 15 percent! Now that’s a compelling reason for any company to install a vertical garden and why PodPlants are becoming so popular.